Defender Papy Djilobodji has had his contract terminated by the League One club. Out of work: Papy Djilobodji. 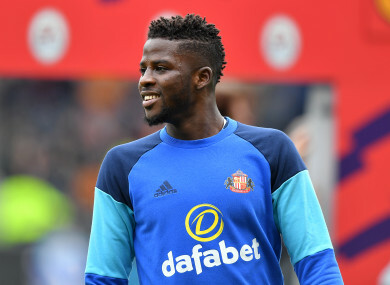 SUNDERLAND HAVE SACKED their £8 million signing Papy Djilobodji after the defender breached his contract and failed a fitness test. The former Chelsea man put in a transfer request in June, and Sunderland claim that he eventually returned in September, “ignoring written requests for his return”, and “comprehensively failed” a fitness test given to all players during pre-season. The club have subsequently issued Djilobodji notice that his contract has been terminated. The move comes after Sunderland previously claimed that they were taking legal advice on the situation, with the defender turning up to training 72 days late. Djilobodji has endured a nomadic career thus far, and was a surprise signing by Chelsea in 2015. He failed to make a Premier League appearance for the Blues and was shipped out to the Stadium of Light after just one season, the second half of which he spent at Werder Bremen. The 29-year-old spent last season on loan at Ligue 1 club Dijon, as Sunderland were relegated from the Championship to League One. The Black Cats have made a strong start to life in the third tier of English football, however, and sit fourth after seven games, winning four and drawing three. Email “Sunderland sack £8m defender who went AWOL for 72 days and failed fitness test ”. Feedback on “Sunderland sack £8m defender who went AWOL for 72 days and failed fitness test ”.